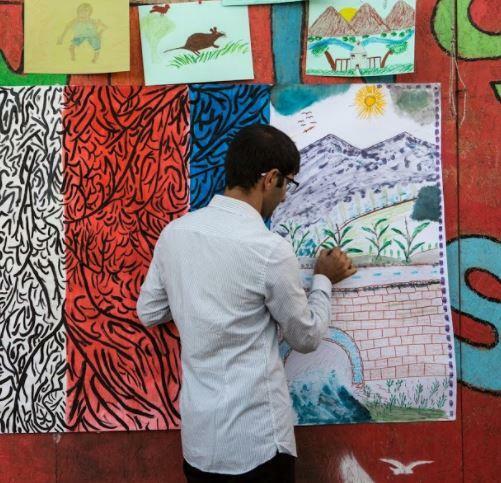 IMAGINE – a small non-for-profit organisation based in London – ran art workshops in Calais in 2016, and Protestimony exhibition is the fulfilment of the commitment to use this artwork for political purposes: protest, advocacy and awareness-raising. Protestimony communicates an alternative narrative about the “refugee crisis”. It challenges the dehumanising and depoliticising rhetoric of mainstream media using artworks and other material created by refugees who lived in the Calais Jungle. The exhibition was developed by Lujza Richter, Marthe Chabrol and Hari Reed as a platform for refugees in Europe to represent themselves to their host communities. Protestimony reminds that refugees should be viewed as political beings, not just victims or perpetrators. Protestimony both records something about refugees in the Jungle, and engages with the problem of representing them in the current political context. The exhibition is self-referential, and places different representational strategies alongside one another to demonstrate that there is no simple ‘truth’ about the refugee crisis. It features documentaries, maps, poems, paintings, sculptures and illustrations. This work is displayed inside makeshift shelters, constructed just as they were in the Jungle. This provides an interactive experience, while emphasising the ethical limitations of this type of witnessing. Protestimony is also a record of the work done by grassroots organisations in the Jungle. The role of volunteers is presented in a way that allows visitors to reflect on the strengths and weaknesses of charity work in Calais, now that the camp has been destroyed. The iconic Refugee Info Bus will provide legal information about asylum, as it did in the Jungle. Most importantly, the exhibition reminds visitors that the refugees who formerly lived in the Jungle have not disappeared, but are stuck in limbo throughout France or sleeping rough in Calais. Lujza Richter, Marthe Chabrol and Hari Reed taught French, English, music and art at the Jungle Books School in Calais during 2016.